SNAP-Instrument Development Team Blog: IDT team reaches 44 GPa on SNAP! IDT team reaches 44 GPa on SNAP! An IDT team including Malcolm Guthrie, Reini Boehler and Kuo Li (all Geophysical Laboratory) has achieved a new pressure record for SNAP. 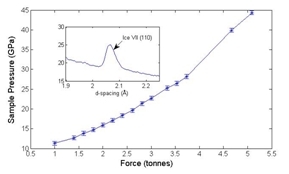 Using specially designed anvils inside a panoramic cell driven by a PE press, a sample of ice VII (D2O) was compressed to 44 GPa at room temperature. The panoramic cell can be gas loaded, adding and adds this important capability to the instrument. Also, optical access facilitates in-situ measurement of pressure via ruby fluorescence.